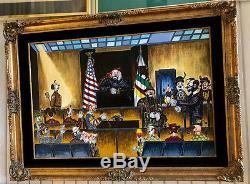 This painting is a mockery of the justice system based on Cohen's last trial. 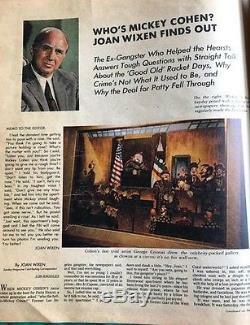 This is the only painting in existence- George Crionas only painted one solely for Cohen because he had great respect him. There is some cracking of the paint on the painting do to it's age but otherwise it very good condition. This is a very big painting 32'H 44'W beautifully and ornately framed. 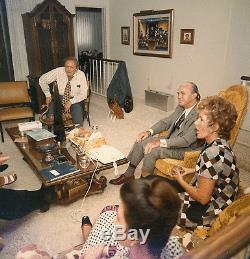 The pictures below show the painting in Mickey Cohen's living room. This famous painting was also featured in Sunday News magazine- Also pictured below. The magazine is included with the painting. 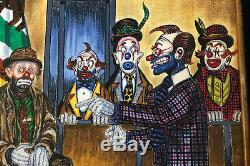 George Crinoas was born in Detroit Mi in 1925 and moved to California where he died in 2004- He specialized in Clown paintings. As a young boy one of his works was submitted to a children's art festival sponsored by Detroit News. George has been in 9 movies including; Halls of Montezuma and The Jackpot. 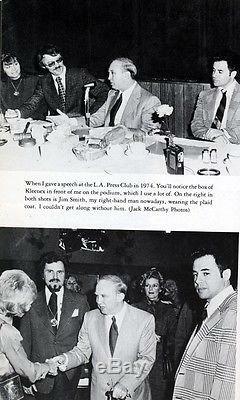 Jim Smith, my father, was Mickey Cohen's right hand Man. When Mickey Cohen died my father took over most of Mickey's possessions. In January of 1972 Mickey was released from the Federal Penitentiary. Jim Smith picked him up from prison and was with him everyday for the rest of Mickey's life. 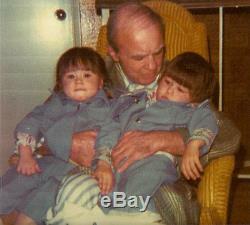 Jim Smith is shown wearing the plaid jacket in the pictures below. This picture was taken from the book Mickey Cohen "In My Own Words". 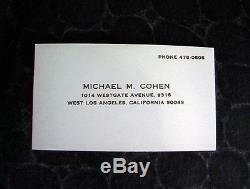 My father took possession of these business cards upon Mickey Cohen's death. They are over 30 years old and very rare. Cohen only gave his business card out to celebrities and VIP's. Mickey Cohen was Ben "Bugsy" Siegel's right hand man. After Ben Siegel was knocked off by his Syndicate partners for skimming from the Flamingo, Mickey Cohen took over the mob's West Coast. He took over for Ben and was very successful. "I took over from Benny right away on instructions from the people back east, " he said. Naturally, I missed Benny, but to be honest with you, his getting knocked off was not a bad break for me. Pretty soon I was running everything out "Cohen's famous quote was "I never killed a man who didn't deserve it. Cohen hung around with all of the Top celebrities and political figures. He was very good friends with Frank Sinatra and the Rat pack. Mickey also had more lives than a cat. Mickey Cohen was born a Leo. 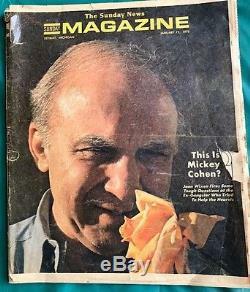 Cohen was shot at, bombed, arrested, imprisoned, threatened, and even hit in the head with a lead pipe by a crazed inmate while in jail. He was also involved in many legendary gun battle's such as the War of the Sunset Strip. Mickey always came back for more. Mickey died of cancer in 1976 but in the end, he outlasted all of his enemies and was one of the most flamboyant and successful gangsters to ever live. He was just as famous as John Gotti or any other Mob figure. Be sure to check out the mob book "LIFE - Mobsters & Gangsters" While many gangsters are portrayed like Capone and Gotti it is Cohen who receives the biggest coverage with a 10 page spread. It's a great book for any Mob aficionado. You can also check out this book on the Time-Life website. My father, Jim Smith, is also featured in the Rogue's Gallery "Mickey Cohen" Video. They shot most of this show at his house in L. There are numerous movies and TV shows coming out portraying Mickey Cohen. This is the perfect way to add to your True Crime collection or to add an painting to your art collection. This is extremely rare Mob memorabilia and all of these items comes directly from my father's personal collection. You will also receive a COA with every item which shows my father with Mickey taken directly from the book Mickey Cohen- In my own words. This very detailed COA also explains how this painting was obtained. My father has recently passed away and left me his entire, most prized and favorite pieces in his private mob collection. Authentic Mob memorabilia is very hard to come by. This painting came directly from the source, my father, and is Guaranteed 100% Authentic. I will personally guarantee every item I sell as Authentic. It would be be impossible to obtain this painting elsewhere because there is only one. 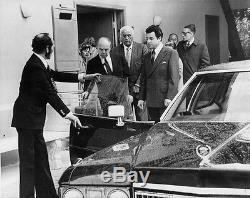 My father knew many Mob figures and I now own many items from other famous mobsters that I have recently decided to sell. My father has collected and treasured many private and personal Mob items through the years. 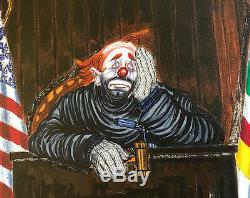 The item "ONE OF A KIND-George Crionas-Hand Painted Clowns for Mafia Mob Boss Mickey Cohen" is in sale since Friday, November 3, 2017. 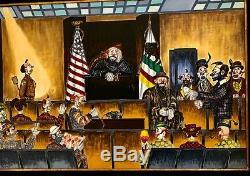 This item is in the category "Collectibles\Historical Memorabilia\Mobs, Gangsters & Criminals". The seller is "jts09" and is located in Studio City, California. This item can be shipped worldwide.